As my old friend, Mickey used to say, "It could use a coat of paint." The Gooseville Mill measures 34' x 40'. I+- ie a cwo-story frame building constructed of 10" x 10" oak timbers with cedar vertical board and batten siding (the only one in the county) and a stone foundation.' 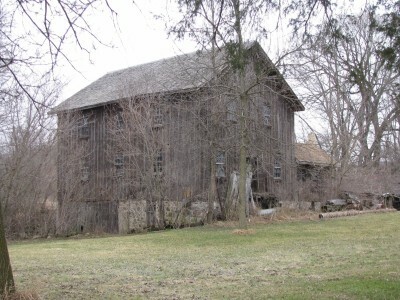 On the north side of the mill the building extends into a board and batten covered basement. This portion is where the mill race runs through the building and where the turbine is housed. Judging from the position of the race to the building, the paddlewheel which existed on the original mill was most likely an overshot type. However, no evidence of this wheel remains. The mill is situated on the east side of Silver Creek-Cascade Road about one tenth mile north of Highway SS and is on SSoney[sic] Creek. The 38 acre mill pond extends to the east and north of the mill site, (l) The dam and mill race are functional and are included in the nomination as the only extant example of the fully intact race-pond-mill complex, in its original isolated setting. There are office and sawmill additions to the east of the structure, which are not a part of the original mill, but do not detract from its integrity or setting. The interior features, although intact and operable, consist of a burr mill and elevator which don't relate to the period of pioneer milling.